Based in Hong Kong, Global Science Press is an academic publishing company for the advancement of mathematical, physical and computational sciences. The mission of the Global Science Press is to enhance interactions among a broad spectrum of scientists worldwide. Visit the Global Science Press website for more information. 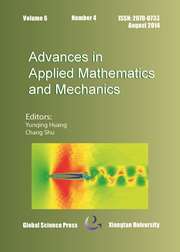 Advances in Applied Mathematics and Mechanics (AAMM) publishes as rapidly as possible manuscripts of high standard, through electronic submission and reviewing. 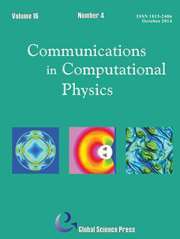 It provides a fast communication platform among researchers using mathematics as a tool for solving problems in mechanics, with particular emphasis in the integration of theory and applications. The mathematical tools used to solve problems in mechanics include analytical, semi-analytical, numerical and artificial intelligence ones. In order to cover as wide an audience as possible, abstract or axiomatic mathematics is not encouraged. As an international journal, AAMM is published in a timely fashion in printed and electronic forms. 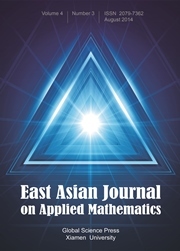 The East Asian Journal on Applied Mathematics (EAJAM) aims at promoting study and research in Applied Mathematics in East Asia. It is the editorial policy of EAJAM to accept refereed papers in all active areas of Applied Mathematics and related Mathematical Sciences. Novel applications of Mathematics in real situations are especially welcome. Substantial survey papers on topics of exceptional interest will also be published occasionally. 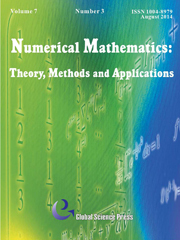 Numerical Mathematics: Theory, Methods and Applications (NM-TMA) publishes high-quality original research papers on the construction, analysis and application of numerical methods for solving scientific and engineering problems. Important research and expository papers devoted to the numerical solution of mathematical equations arising in all areas of science and technology are expected. The journal originates from the journal Numerical Mathematics: A Journal of Chinese Universities (English Edition). NM-TMA is a refereed international journal sponsored by Nanjing University and the Ministry of Education of China. As an international journal, NM-TMA is published in a timely fashion in printed and electronic forms.